WordPress Themes are here to stay. Throughout the years, we’ve seen many different design styles and trends – some good, some not so good. 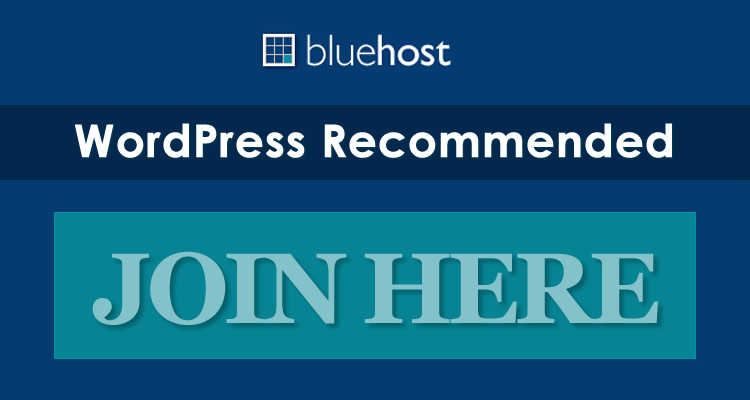 With WordPress powering a colossal 1/5 of the entire Internet, WordPress Themes have become big business with many individual theme shops and developers pulling in millions every year. Any way you slice it, WordPress is here to stay, and for that reason so are the free and premium themes we’ve all come to know and love. If you have spent any amount of time searching for the top WordPress Themes, you’ll notice that several names continue to appear at or close to the top of the list. Elegant Themes, Themeforest, and StudioPress to name some of the more popular ones. In this article, we’d like to introduce you to some very creative and compelling WordPress Themes of 2013. 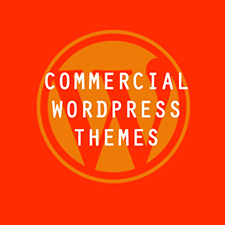 Each and every one of these themes was released in 2013 so you can rest assured these are among the latest and greatest that WordPress has to offer. Stay in the know with our list of the top overall WordPress Themes as well. Updated at least once per month, this article covers the best WordPress Themes in all the different categories including responsive, portfolio, magazine, business, and E-commerce just to name a few. For the time being, here are a few of our absolute FAVORITE WordPress Themes for 2013. StyleShop is one of the latest themes from Elegant Themes. This wonderful ecommerce template is compatible with the popular WooCommerce plugin and includes many of the high end features you’ve come to know and expect from Elegant Themes. 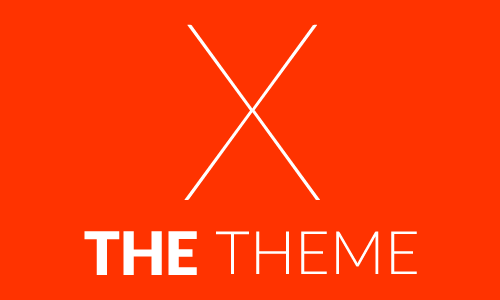 Even better, it’s part of the Elegant Themes club which gives you access to nearly 100 premium themes from just $39. Nash is a very slick one-page responsive WordPress Theme. This is starting to be a trend in many of the premium themes we are seeing in 2013 over at ThemeForest and for good reason. If you are selling a product or service the old “long form” page is known to convert. This updated version of that tried and true layout will leave your visitors impressed and hopefully your wallet too! Bretheon will give you a fresh and clean look that is different from the crowd. 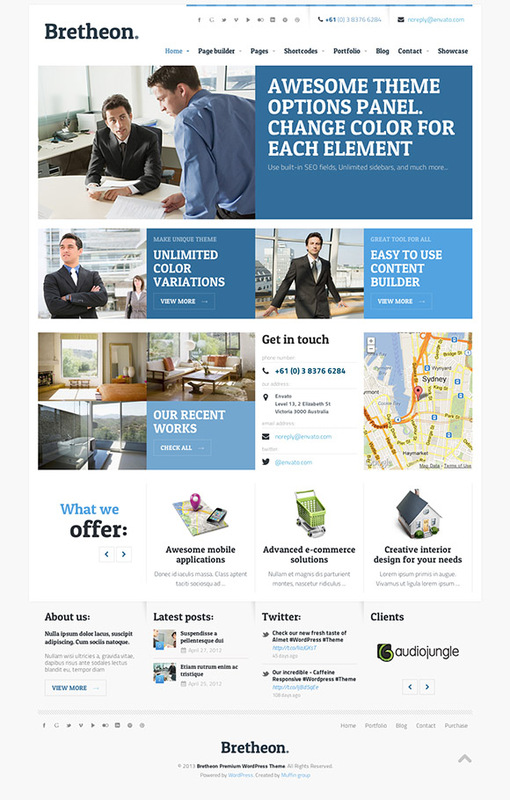 This wonderfully crafted business WordPress Theme for 2013 is packed with a content builder (drag and drop your own page layout ideas), shortcodes, extensive theme options panel, and more. Voyage – This travel WordPress Theme from ThemeFuse is a great way to showcase your properties if you are a travel agency or have a related business. Being fully responsive, this will allow you to showcase your properties on all devices (desktop, mobile, tablet, etc) with absolute beauty. Impress your visitors and clients with this stunning travel theme in 2013. ClassiCraft is a very niche WordPress Theme for 2013 but will still have appeal to those looking to start their own classified site powered by WordPress. InkThemes has built some awesome WordPress Themes in the past, however we especially like this one for the very specific application it provides. If you are looking to create your own classified platform this year, be sure to check out ClassiCraft. Metro is inspired by the latest Windows 8 operating system of the same name. 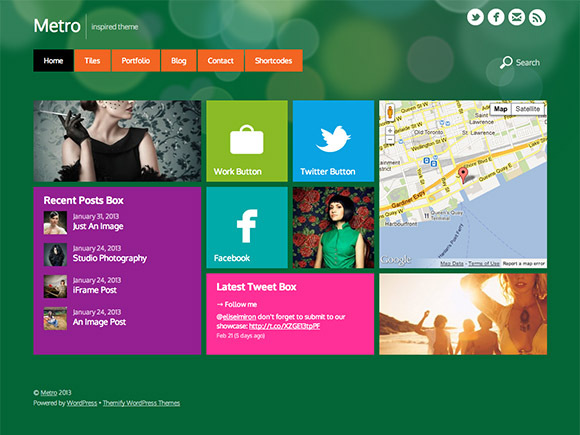 If you find yourself loving the tiles and layouts of Microsoft’s latest iteration, check out what our friends at Themify have put together for you in Metro – a truly unique WordPress Theme for 2013. 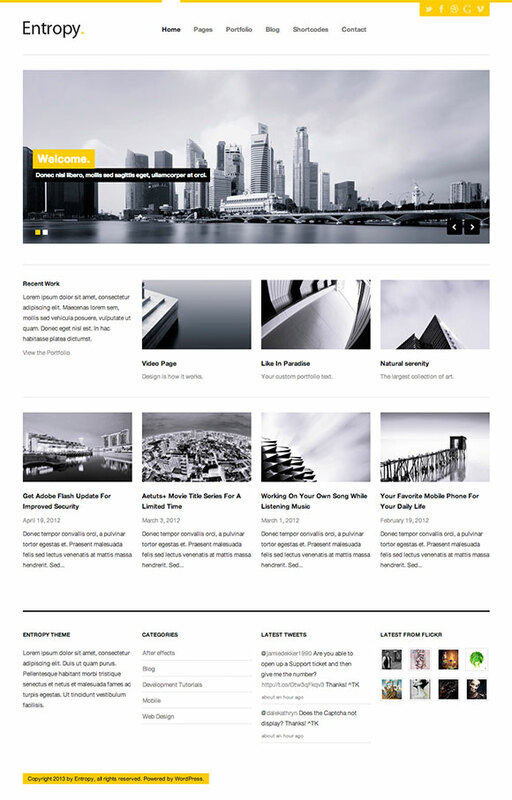 Anchor is a new responsive WordPress Theme from Templatic that is absolutely GREAT for magazine “themed” websites. With many features built right into the theme including WooCommerce functionality, this all-purpose theme is sure to be a great choice for your client or personal projects this year. On top of that, Templatic provides full support and updates for their themes as do just about all of the premium theme developers these days. Mozzy is all about 2 words: Simple & Flexible. If you like the more animated/hand drawn web design look, Mozzy is a great Theme to consider. With earthy tones and a fully responsive layout, Mozzy is a cool option to consider for your next WordPress Theme project. Petit is especially useful for a recipe of food related website, but it can also do much more. With a responsive layout and many of the latest trends of theme development of 2013 built right into the theme, Petit is a wonderful example of all that is possible in high-end premium themes of this year. Even better, it has built in ratings system that integrate with Poll Daddy so you can truly build a community around your craft (people LOVE ratings and it is a great “stick” factor for your site). Entropy is probably one of our favorite themes for 2013. Yes, it is a beautiful and clean design that is fully responsive and packed with shortcodes and features. But what we love about Entropy is the company behind it. 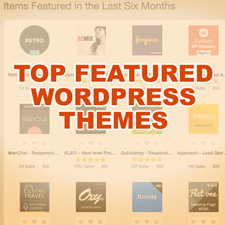 Themes Town has put together an amazing product with over 200 themes and plugins for just $55. Included is a list of their favorite free themes that they have reviewed and tested to be free of malicious code, etc as well as many of their own premium themes you can only get through Themes Town. Add to that a one-time price of $55, and you have the best deal in WordPress for 2013! Check them out today. Very helpful article with awesome screenshots.